Some high school students definitely know they want to go to college. But there are many students who don’t know exactly what they want to do. They do know that they want something different. For some, they want to work with their hands. For others, it’s taking a different path that doesn’t involve taking out lots of student loans. And for others, it’s about finding a secure, good-paying job for which they feel respected. The key to discovering what’s right for you comes down to being open minded and trying new things. For Lah Htoo, a senior at Como Park Senior High School, the journey of trying to figure out what to do with the rest of his life after he graduates from high school has been full of twists and turns. 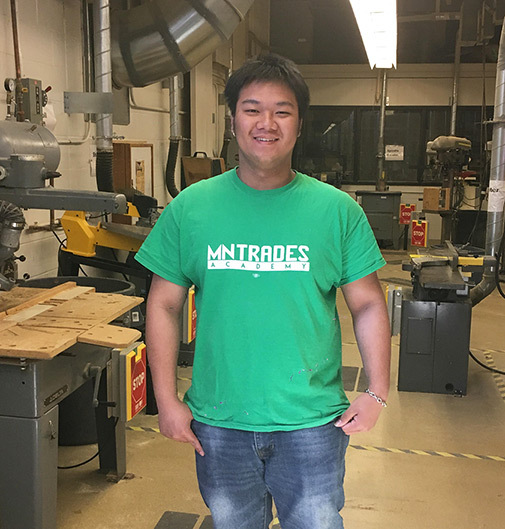 But one thing is clear, participating for two summers in a row in a program called the Minnesota Trades Academy, has helped him see that he can achieve many things if he puts his mind toward it. Born in a refugee camp in Thailand, Lah and his Karen family (his parents and three sisters), originally from the country of Myanmar (once known as Burma), emigrated to the United States in 2009 to start a new life. Along with the Bamars and Shans people, the Karen people are one of several ethnic groups within Myanmar. The Karen people call a mountainous region in eastern Myanmar as home. The Karen have struggled for decades to assert their identity and independence from the Myanmar government. “I remember making my own toys,” Lah says, reflecting on his years as a young boy in the camp. As you can imagine, making the transition was not easy for his family but Lah quickly caught on at school. In elementary school, he surprised himself when he won first place in a school competition in which he built a bridge made out of toothpicks and wood glue. At Ramsey Junior High School, Lah joined Lego League. In high school, he gravitated toward woodworking, taught by Bob Prifrel, who retired last year. 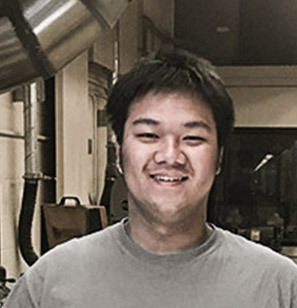 It was Mr. Prifrel, who suggested to Lah that he consider enrolling in the Minnesota Trades Academy program during the summer following his sophomore year at Como Park High School. Starting just two weeks after the conclusion of the school year, the nine-week program exposes a small group of high school students to various career opportunities in the construction industry. The Minnesota Trades Academy is a paid summer construction internship experience. The goal is to help youth prepare for adulthood through lifelong learning, skill development, and the access to good jobs with good benefits in the construction industry. The program aspires to provide rich educational and hands-on experiences for participants to earn while they learn about construction as a career choice. The beauty about this program is that it allowed Lah and the other dozen or so students who participated to learn about the wide range of construction-related jobs. It was between his participation in the Minnesota Trades Academy and all of the time he liked to spend working and building things in the Como Park woodworking shop that he realized that the path of an accountant, lawyer or doctor, which many of his other friends were contemplating, was not necessarily right for him. To Lah, the combination of meeting real construction workers and learning about their careers combined with his own desire to work with his hands – doing woodworking, welding and carpentry – helped him see that he could bring together his desire to build things into a career. With this focus, Lah’s plan is to pursue a degree in civil engineering, first at Century College, and then the University of Minnesota, while staying close to the construction industry. It’s a path that his family approves of. Being free to try things has been important to Lah and to his family. While he gravitated to woodworking classes and industrial arts at Como Park High School, Lah also was a member of the school’s robotics club, he participated in peer mediation, he got involved in Big Brothers Big Sisters, and he even joined the Muslim Student Association.